Most VMS based monitoring solutions rely on a binary (limited detail) alert being generated from a site (either via RF, GSM, Contact ID or IP), which then triggers the control room operator to launch the site-specific live feeds in the VMS solution to facilitate a live investigation. More advanced VMS solutions do provide video verification, but are prohibitively expensive, rely on video analytics as a trigger (high false alarm rate) or only integrate with closed intruder detection hardware dictated by the VMS ecosystem (often requiring rip-and-replace and/or limited options). Limited data bandwidth in outlying areas due to legacy ADSL solutions is another challenge facing clients. Lastly, these solutions do not in any way leverage or empower local staff responsible for these sites to engage with the site security, and/or support in the event of a security event. Each Sentian 3i is a flexible, remotely upgradeable, multilingual ‘brain’ for your property. A unit is placed at each site and connects existing or off-the-shelf security, CCTV, access and automation systems. It is a computer with significant processing power, which through the Sentian software creates a single platform, integrating these often disparate systems, allowing them to work together to solve problems they cannot fully solve individually. All this while connecting them to all the enormous resources and services in the cloud and the oversight and responsiveness of a control room and/or giving users a simple, intuitive and informative real-time app to control it all. Superior visual engagement. With Sentian, a user defined event is annotated with a 12 second free flowing video, 6 seconds before, 6 seconds after, showing you all the context required to identify what triggered the event. The sites camera live feeds are also easily monitored remotely and Sentian’s advanced event annotated remote archive video search capability makes finding relevant video footage rapid and data efficient, empowering management and control room staff to audit site activities and process compliance. Edge computing. With a Sentian unit at each site, you not only have every site linked to the Cloud, but you have processing capability at each site providing all the benefits of edge computing. These include network flexibility where data costs or bandwidth are constrained, faster response times with distributed computation, reliable operations with intermittent or unreliable connectivity, security and compliance with most data flow limited to each site, interoperability between legacy and modern devices, and versatility due to edge computing’s rapid scalability. Next level threat response capabilities. Sentian immediately delivers the information your control room, or staff, to empower them to quickly and efficiently respond to a threat event. You can remotely engage with your site, to respond to an event, escalate the call to armed response, activate an on-site threat response, notify local staff, activate emergency response systems such as fire suppressants, activate or deactivate physical barriers or electrical control equipment. All of this can be done with live visual verification, eliminating automated response limitations. Enhanced centralised, or decentralised control. Sentian not only provides you with the ability to super-charge your control room capability, but gives you the option to either augment the control room by allowing local staff to engage with and monitor sites using the Sentian app, or remove the central control room completely. This option would rely on the typical hub and spoke organisational structure and the Sentian app, to create a multi-layered self-monitoring solution allowing for local staff and their relevant managers to respond to threat events. They have the most context and are often better positioned to identify and respond to events. Monitoring more than just security. 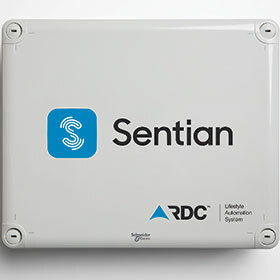 In addition to being able to remotely control elements on site, with Sentian you can proactively create site specific notifications (with video) linked to environmental factors, hardware or system status, process compliance or access logging. This means relevant staff, or the control room, can monitor and manage beyond security, tracking compliance, safety, staff attendance, system maintenance and performance conditions and uptime. Lower hardware and operating costs. The benefit of integrating with off-the-shelf, commercial grade security, CCTV, access and automation systems is that you can leverage your existing installed infrastructure rather than having to pay the high cost of rip-and-replace alternatives. If any new hardware is required, a broader selection of options provides freedom to optimise within your budget. The high cost of dollar denominated international software licensing fees makes Sentian’s low cost, per site, Rand-based, fee structure extremely attractive. Platform flexibility. The platform has been developed with agility in mind. Technology is changing fast and unpredictably. We embrace this paradigm and have created Sentian to grow and adapt to market requirements. Each Sentian unit is upgraded remotely as new software features and patches are released. The hardware itself is over-engineered and modular in design to allow for low cost upgrades and additions if required. Similarly, the software architecture allows for ever-changing use cases and priorities. No planned obsolescence. Sentian is predominantly a SaaS (software-as-a-service) business. It is almost hardware agnostic and does not become obsolete. It is a computer, so new features and capability will and can be added automatically to the existing hardware remotely, making Sentian a dynamic, flexible, evolutionary and market responsive product. Locally created, for local environments. It was designed locally for local conditions and context, with local support from the creators of Sentian.